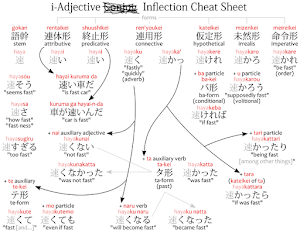 The Jisho Kioku is a Chrome extension that adds a number of features to the online Japanese-English dictionary Jisho.org. 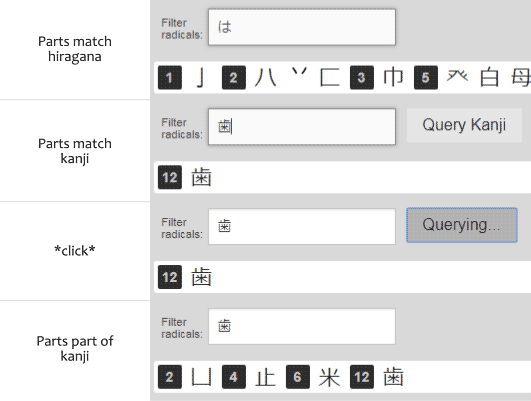 These features are: shows the last dozen kanji you've picked from radical search; lets you quickly filter radicals by their names; records the last hundred searches you've made; and lets you bookmark random vocabulary so you can review it later. Drag and drop jisho-kioku,crx into your extensions. The permissions required are storage and unlimitedStorage (so it doesn't hit the storage quota of 5MB one day). And also the ability to modify Jisho.org's pages. Sorry, chromium-only. Are there even non-chromium browsers anymore that support extensions? Internet Explorer? 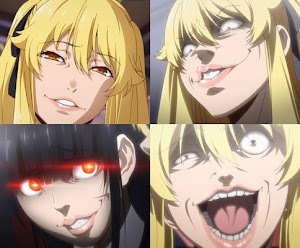 I mean, Edge? Does that support extensions? Anyway, if you have coding knowledge you can probably port it to your weird browser because it only uses the chromium API to save and load data. Kioku will remember which kanji you've picked from radical search and show them in green. The greener it is, the more recent. 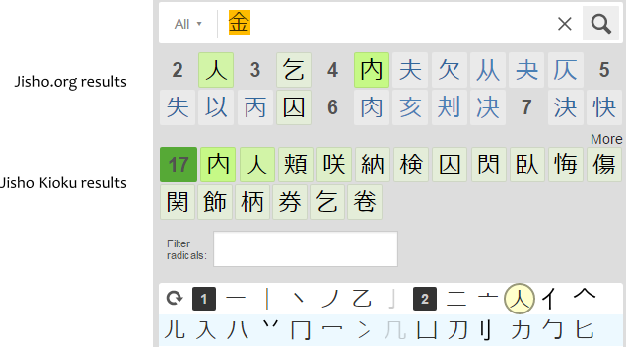 This helps find kanji from radical search if you are trying to find the same kanji a second or third time. Besides tinting green Jisho.org normal results, Kioku also shows a similar set of results right below those. The difference is that Kioku's results only include kanji you have picked at least once and always shows the most recently picked first, not by stroke order. When a radical isn't selected the most recently picked kanji are shown unfiltered. 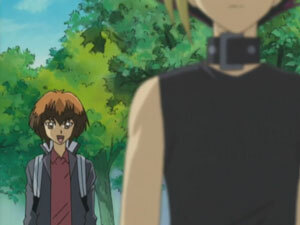 Clicking on the reset button in the radicals' list also forces Kioku to show the most recently picked. Not all radical have names, but some of them sort of do. Kioku comes with a filter box above radicals that can be used to quickly find a radical provided you know the name for it instead of trying to find that stupid damn thing for 10 minutes and feeling like a idiot. If you don't know the names of the radicals which were used for this filter specifically, hovering the mouse pointer over a radical shows its name in the tooltip. 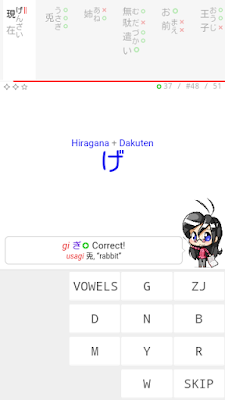 You can type hiragana, katakana or romaji in the box. Pressing enter automatically selects the first radical in the list, but you can type a number to filter by index. For example: if "te" shows 3 radicals and you want the second one, not the first, type "te2," then only the second one will be shown, and then you press enter. Matches radicals starting with "abc"
Matches only the second radical starting with "abc"
Matches all radicals with 3 strokes. Matches only the second radical with 3 strokes. 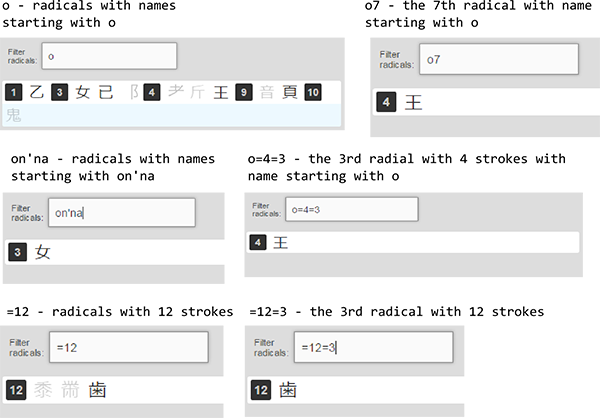 Matches all radicals with 3 strokes starting with "abc"
Matches only the second radical starting with "abc" with 3 strokes. It's also possible to show only the radicals of a given kanji. If you type a kanji in the filter box, the button "Query Kanji" will show up. Clicking this button will search Jisho.org in the background and fetch the radical data. Pressing enter while the button is shown will *click* the button only if there are no radicals in the results. That is, if you type the hito 人 kanji, there's already a radical that's exactly that in Jisho, so it will select the 人 radical instead of querying. 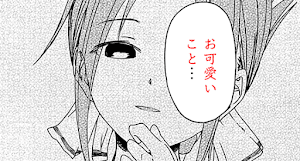 But if you type hibiku 響く then press enter, there's no 響 radical, so it will press the button instead. Also note that normally clicking on a radical automatically clears the filter, but when a kanji parts are shown that doesn't happen. This is as intended: this way you can type a kanji and select multiple of its radicals without having to retype it every time. The Searches link under the 記憶 menu shows the most recent things you've searched for. It records over 100 queries. Update 0.3.1: You can click the remove link to remove a search you don't want to see for some reason. The recent searches are also automatically added to the search box as a dropdown. Pressing the down key or clicking on that down arrow shows your recent searches without you having to navigate through the 記憶 menu. You can bookmark vocabulary by clicking the memorize link at the bottom of each word. This link may take a couple seconds to show up because extension scripts are the last thing loaded in a webpage, but it will show up one day maybe. Kioku stores the term, its furigana and the meanings in your browser so you can review it later. You can find the stored terms under the bookmarks link under the 記憶 menu. The forget link forgets the term. Unchecking the meaning checkbox will temporarily hide the meanings and will hide forget link. This is so you can copy-paste the terms without their meanings and without copying a bunch of "forget forget forget forget." Also, the bookmarks are not ordered. And when you click on the memorize link it will say bookmarked, but when you reload the page it will say memorize again even though it's already memorized. This was deliberate so it wouldn't make every single page of the site load slower just to show whether something's already been bookmarked. On the plus side, bookmarking something already bookmarked does nothing bad, so there's that.